New barrage of interventions in the European Parliament regarding the environmental crime in S. Karystia was done by Notis Marias, professor, member of the European Parliament and president of the political party "GREECE - AN ALTERNATIVE ROUTE", while speaking in the plenary session of the European Parliament in Strasbourg, in December 10-11th 2018, occasioned by the discussion about the familiar 'Life' European program. During his first intervention, Notis Marias, addressing the European commissioner Vella, marked: "Life program is indeed important for the protection of the environment, particularly for the support of the biodiversity and has contributed in the formation of Natura regions. Nevertheless, Mr. Vella, I would like to raise a serious issue, that I have been repeatedly lodging a complaint that in the area of South Karystia, in the Ochi mountain, which is characterised as Natura region, there has been a violation and infringement of the environmental legislation. Many wind parks are being installed, which do not conform with the prerequisites. You, yourself, have replied to me that the European Commission will indict Greece for legislation infringement concerning the installation of wind turbines and wind parks". Notis Marias continued: "The same violation is taking place in another area, namely, in Agrafa and in Monemvasia as well. But the question is when will you indict Greece? There has been a very long time. Legislation infringements continue to take place and when this matter reaches the court, it will be very late. Mr. Vella, I would like a reply. When will the European Union legislation at last be applied in Greece?" 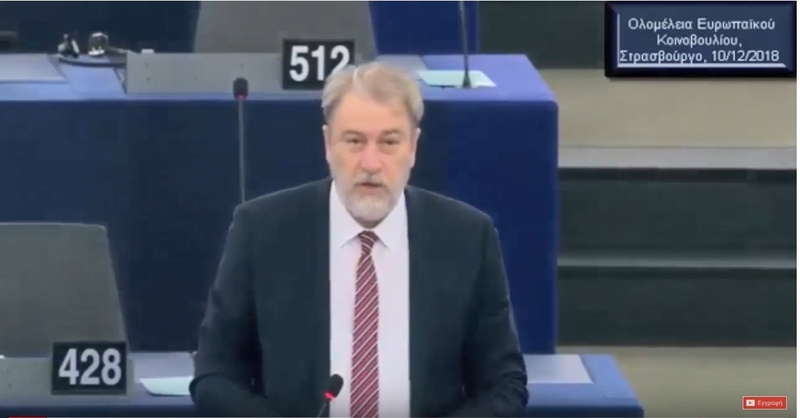 In his second intervention, the Independent Greek member of the European Parliament said that "Life program is important for configuring Natura regions and based on this premise, we should support it. Nevertheless, what happens in Greece is that the kind of policy that is applied for the installation of wind parks, in reality, destroys the Natura regions and I have referred repeatedly to the South-Karystia-region case and to the Ochi mountain, which has been characterised as Natura region. Nevertheless, a large number of wind parks are being installed there, in violation of the environmental legislation and while the European Commission has announced that it will indict Greece to the European Union Court for violation of the legislation concerning the installation and operation of wind parks, still, it has not done it yet." Notis Marias concluded: "Even yesterday I asked Mr. Vella when will this commitment, at last, take place, when will the legislation, at last, be implemented in Greece, but didn't receive any reply. We are waiting to see when will the environmental legislation be applied in Greece."